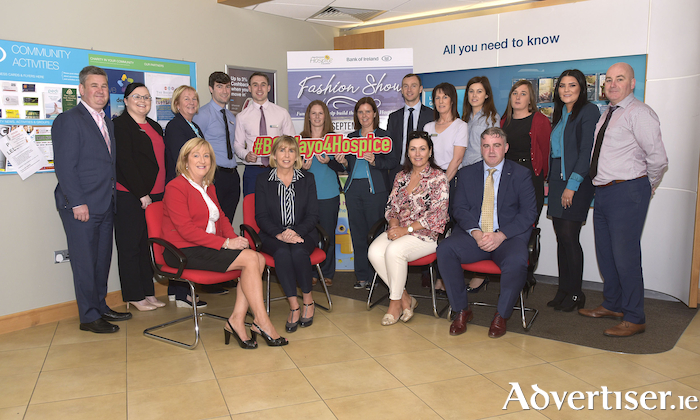 Staff of Bank of Ireland branches in Mayo will host a Fashion Show to raise funds for their chosen Charity, Mayo Roscommon Hospice. All funds raised will go directly towards building the new Mayo Hospice Unit in Castlebar. The fashion show will be held in the CastleCourt Hotel Westport on Thursday September 20 – starting with a wine reception at 7.30pm. Models will show-case outfits from local shops in both Castlebar and Westport. The MC on the night will be Mandy Maher Catwalk Model Agency. Special Guests on the night include Paul Galvin and members of the Mayo Senior Football Team. Tickets are €10 each and can be purchased in any Bank of Ireland Branch in Mayo.